MIDI Guitar for Garageband update. The Mac Store version of MIDI Guitar was just update to version 2.0! It comes with the latest v2 tracking, and lots of new features, but it has some limitations compared to the plugin version. Please let us know if you like it or if you have any problems, snd please remember to rate it at the Mac Store. MIDI Guitar 2 for iOS is here! 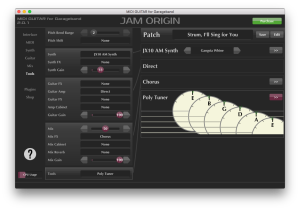 MIDI Guitar 2 BETA14 released!